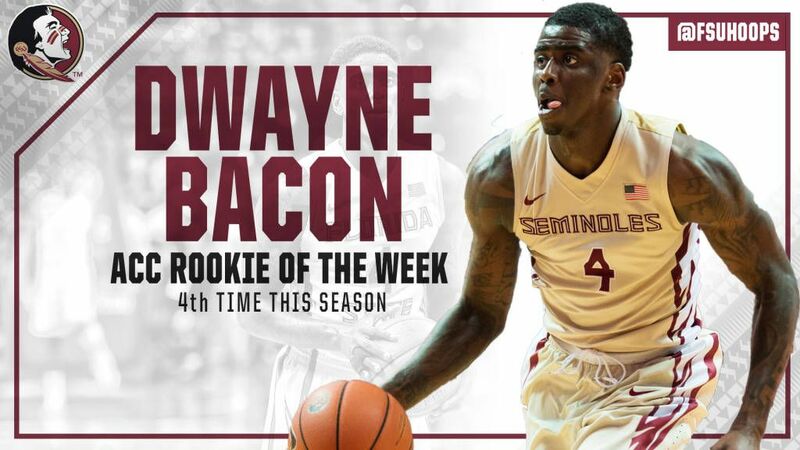 TALLAHASSEE, Fla. (seminoles.com) — Florida State freshman Dwayne Bacon, who averaged a double double of 16.5 points and 10.0 rebounds as he led the Seminoles to a pair of wins last week, was named the ACC Rookie of the Week for the school record fourth time as determined by the vote of a blue ribbon media panel. Bacon scored 21 points in the Seminoles’ win over Clemson and recorded his third career double double of 12 points and 14 rebounds in their win over Boston College. Bacon has now been named the ACC Rookie of the Week a school record four times – one more time than Michael Joiner earned the award during the 2000-01 season. Bacon (four times) and Malik Beasley (twice) have earned the ACC Rookie of the Week honor a combined school-record six times this season. Bacon (Lakeland, Fla.) totaled a career-high 14 rebounds in Florida State’s victory over Boston College on Tuesday night. The 14 rebounds are tied for the eighth best single game rebounding total in ACC play by a Florida State player and were the most rebounds by a Florida State player in an ACC game since Chris Singleton grabbed 14 rebounds against Maryland on Jan. 10, 2010. Bacon’s 14 rebounds ranks as the second highest rebound total in an ACC game in school history by a freshman. Michael Joiner pulled down a Florida State freshman record 17 rebounds against Wake Forest on Jan. 9, 2001. The double double ranked as his third of the season – tied for the second most among all freshmen in the ACC. Bacon totaled a team high 21 points to lead the Seminoles over Clemson on Saturday. His 21 points included a career-high tying 15 first half points – a total that staked the Seminoles to as much as an eight point lead and a 32-38 halftime advantage. Bacon scored five of Florida State’s final seven points of the first half as Florida State increased a two-point lead with 6:53 remaining in the half to as many as eight (on a Bacon lay-up at the 2:44 mark) and eventually to their four-point halftime advantage. All six of Bacon’s six second half points came in the final 5:10 of the game and helped Florida State to as much as a 12-point second half lead in winning by double digits for the second time during the week. Bacon has scored in double figures in each of the Seminoles’ last 13 games. He has scored 215 points and is averaging 16.5 points scored per game, has scored at least 20 points five times, and is averaging nearly 30 minutes played per game (29.8). Bacon is the team leader with a 6.5 rebounds per game average. Bacon has scored in double figures in 19 of the 21 games he has played as a Florida State freshman. He is only nine points shy of having scored in double figures in each of the first 21 games of his career.